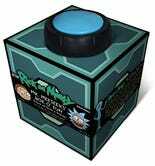 I think Oppo needs its own Meeseeks Box. As you know, Mr. Meeseeks will help you with an issue, resolve it, then Peace Out. I think my request would be simple enough: tell him I want another car and ask him to look at my current situation, and layout a foolproof plan to achieve what I want. Worse case scenario, Mr. Meeseeks would only be around for 4 hours or less. But for now, we only have a card game (I wish there was a mobile version) and the cool DIY projects. What would ask Mr. Meeseeks?